LAS VEGAS (AP) – Autumn de Forest’s signature includes a heart hovering over the second “U” of her first name. Considering that she turned 15 a few weeks ago, that’s not much of a surprise. The surprise is where that distinctively girlish signature appears: on paintings that, collectively, have sold for millions of dollars. But maybe it’s not so surprising. After all, Autumn has been a working artist for most of her young life. The first public showing of her work took place in 2009 at Boulder City’s annual Art in the Park, where she won an award a year after she first picked up a brush, at age 5. Since then, Autumn’s paintings – and Autumn herself – have traveled the globe. Last year, she visited Rome to accept the International Giuseppe Sciacca Award for Painting and Art _ and presented a painting, titled “Resurrection,” to Pope Francis. This year, the Butler Institute of American Art in Youngstown, Ohio, extended Autumn’s solo exhibit from two months to almost four because of its popularity. Now, she’s heading to Miami Art Week for Red Dot, a juried show featuring the works of more than 500 contemporary artists. Last weekend, Autumn stayed home – for her first Las Vegas exhibition at the Gallery of Music & Art in the Forum Shops at Caesars, where her work will be a permanent feature at the gallery, director Barry Jacobson said. Alongside some of Autumn’s paintings is a video monitor featuring footage of her working on canvases taller than she is. You can still see that little girl in the enthusiastic, articulate – more accurately, downright chatty – teen of today. Hovering over a table placed in the back of the gallery – which has been expanded to include studio space – Autumn wields bottles of brightly colored acrylic paint, then picks up a metal rod to push fluorescent red, pink and yellow streaks across a sheet of canvas, conjuring a striated sunset. That’s “one of the great benefits of living in Las Vegas: some absolutely gorgeous sunsets and sunrises,” she says. The gallery is “really my first home for my works here in Las Vegas,” and having a studio means she can present workshops similar to the ones she’s led, from New York to California, as a member of the President’s Committee on the Arts and the Humanities. “It’s such an incredible opportunity,” Autumn says of the committee’s Turnaround Arts program, which counts cellist Yo-Yo Ma, actress Reese Witherspoon and other “older but influential people” among its members. The kids in the program “don’t look upon those people as a peer; I’m their age,” she says. And when she helps them create self-portraits she uses a technique she calls “Face Values,” with photographs projected onto blank canvases. “It’s something very personal to them,” Autumn says. “She is a great peer role model – embodying the ideals of the confidence, joy and success that students can achieve through the arts,” Fletcher said in an email. That’s what Autumn has done since the day her dad, Doug, was staining some wood and Autumn picked up a paintbrush. Her dad said it looked like a Rothko. Autumn had no idea who Mark Rothko was – then. Now, the renowned abstract expressionist is one of her favorite artists. From Jackson Pollock’s drip-paint abstracts to Andy Warhol’s pop art portraits, Autumn’s influences emerge from her canvases. When she painted a bouffant-coiffed Barbie doll in the style of Warhol’s Marilyn Monroe, Autumn thought, “`If he can do this with Marilyn Monroe, I can do this with Barbie,”’ her mother, Katherine, says. Louis Zona, Butler Institute executive director, says that as with any younger artist, Autumn is searching for her own style. After Autumn’s first effort (the one that reminded her father of Rothko), “I did more and more,” she says. Of course, both Doug and Katherine de Forest were predisposed to foster their only child’s creativity. He’s a musician and composer; she’s a former actor and model. 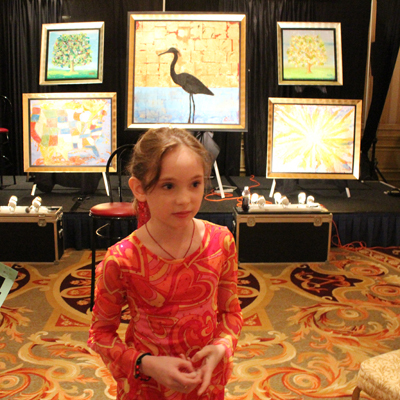 After Autumn made her Art in the Park debut, the word got out “and somehow it got to the Discovery Channel,” he says, followed by NBC’s “Today Show,” PBS, the syndicated “Inside Edition” and more, all by age 9. Autumn estimates she has painted almost 2,000 canvases. Katherine estimates that translates to “probably $7 million worth” of paintings. The money goes into a trust. Although Autumn wasn’t aware of it when she first picked up a paintbrush, she’s not the first member of the de Forest family with an artistic bent. Her great-great-uncle Robert Weeks de Forest served as the president of New York’s Metropolitan Museum of Art from 1913 to 1931. And her great-great-uncle Lockwood de Forest (1850-1932) was a member of the Hudson River School, according to Doug, whose sister and aunt also are artists. And while “a lot of my friends know I love to paint,” she doesn’t tell them that she travels internationally in connection with painting. “It’s almost like looking into a mirror,” she says.